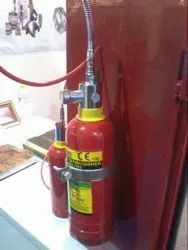 Manufacturer of a wide range of products which include polymer tube based fire detection system. Our reputation in the market is largely attributable to our precision-engineered Fire Trace System. This system is designed and manufactured using exceptional quality components and advanced technology by our vendors. In order to ensure quality, this system is stringently tested on different parameters by our vendors. Apart from this, high performance and sturdy structure increase the demand of our offered system in the market.